With enough sales to break into the Top 5, the lovingly-made, critically-acclaimed Bakersfield breaks onto the chart this week for Vince Gill and Paul Franklin. Read on to see how much the duo sold while another duo, #1 Florida Georgia Line, celebrates their first Platinum album this week! 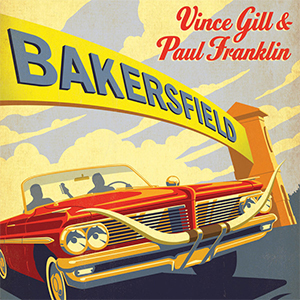 Vince Gill and Paul Franklin Debut in Top 5 with Bakersfield. Rest of Top 5 includes FGL, Blake Shelton, Hunter Hayes and Darius Rucker. Now officially certified Platinum, Florida Georgia Line’s Here’s To The Good Times remains the top-selling Country music album of the week, with 28,000 fans taking home a copy of the album this week. Blake Shelton’s Based On A True Story... remaisn #2 with sales of 16,000 whilel Hunter Hayes Hunter Hayes (ENCORE) is nearly Platinum. Vince Gill and Paul Franklin’s MCA Nashville album Bakersfield debuts in the Billboard Top 200 Albums Top 25 with sales of 12k, enough to be the #4 country album this week. Finally, Darius Rucker’s True Believers surpasses the 300k sales mark with 11,000 fans taking home a copy of the album this week. iTunes Sale Propels Essential Johnny Cash album to #6. Taylor Swift, Jason Aldean, Lady Antebellum and The Band Perry Round Out Top 10 of The Roughstock Top 10 Country Albums Chart This Week. Thanks to a remarkable $6.99 sale on iTunes for double albums from music’s classic stars, Johnny Cash’s The Essential Johnny Cash sold 604% more copies than last week, with 10k this week (1,400 last week). Next on our rundown is Talyor Swift’s nearly 4x Platinum RED. That album sold 9,000 copies while Jason Aldean sold 8,000 copies of Night Train while Golden from Lady Antebellum is approaching 400,000 total sold with 8,000 more added to the tally this week. Finally, The Band Perry’s Pioneer closes out the Top 10 with sales of 6,000 copies. The album itself surpassed the 400k sold mark in 18 weeks on the chart. It’s now well on its way to a Gold certification. Notable albums include Platinum Tornado From Little Big Town, Luke Bryan’s Doin My Thing, Lee Brice’s Hard 2 Love and More! With only one new release album of note (see above), this week we get the chance to check in on a few albums we’ve not chronicled recently. We start with Little Big Town’s latest Platinum album, Tornado. The album has nearly scanned that number while Kip Moore’s up to 374k scanned with Up All Night. The album should eventually surpass the Gold sales mark (likely after the release of his sophomore album). The Civil Wars’ self-titled sophomore album hit stores this week and has a shot at scoring the feuding duo a #1 album in all of the USA but their self-released first album Barton Hollow makes a re-appearance on our rundown with sales now over 618k for the album released in 2011 (and featuring “Poison And Wine”). Lee Brice’s Hard 2 Love is next with sales pushing 500k as “Parking Lot Party” looks to be the 4th out of 4 singles to hit #1 and get certified Gold and or Platinum on the Singles sales chart. Finally, Luke Bryan’s sophomor album Doin’ My Thing is one of three albums from him on this Top 200 Albums chart. The record has scanned 861,000 copies. While still 140,000 copies away from being a Platinum album, it is already certified as such by the RIAA for shipments to stores. Nest week we’ll see The Civil Wars, Brett Eldredge and Clint Black appear on this chart. As always, check back here to see all the details!